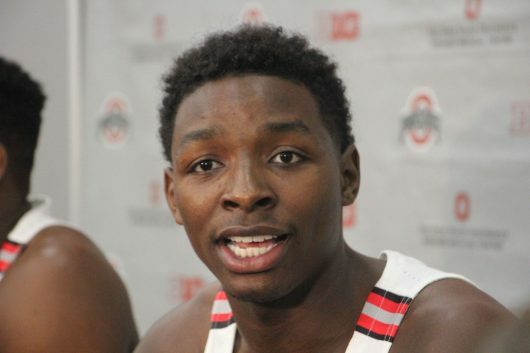 Ohio State men’s basketball players said Wednesday they were aware of the ongoing FBI investigation into college basketball corruption, but made clear they hadn’t experienced anything similar to the allegations. Sophomore center Micah Potter said he had not experienced any illegal recruiting and added that former head coach Thad Matta had done things the right way while on the recruiting trail. The college basketball world was rocked Tuesday with the FBI’s announcement of a wide-ranging fraud and bribery scandal involving 10 people, including Power 5 schools, financial advisors and a top Adidas executive. The FBI has subpoenaed employees of Nike’s AAU circuit, EYBL, and documents, according to sports attorney Darren Heitner. Assistant coaches from Auburn, Arizona, Oklahoma State and USC have been charged with fraud, corruption and bribery, among other charges from the ongoing investigation. Ohio State has not been mentioned in the investigation. According to FBI documents, assistant coaches accepted cash bribes to funnel players financial advisors and agents in one scheme, and James Gatto, director of global marketing for Adidas basketball, gave six-figure payments to three individuals to steer those recruits to programs affiliated with the company. Louisville placed coach Rick Pitino and athletic director Tom Jurich on unpaid administrative leave Wednesday after the FBI released evidence that an assistant coach allegedly planned to pay $100,000 to the father of an All-American recruit. Senior forward Jae’Sean Tate would not comment on the investigations because he said he did not have enough details to properly speak on the situation. The investigation is ongoing and more schools than the aforementioned four could be in hot water as the FBI continues its investigation. Sophomore Andre Wesson also said he experienced no foul play in the recruiting process. He emphasized that he had no concern with the investigations because it did not affect the team.